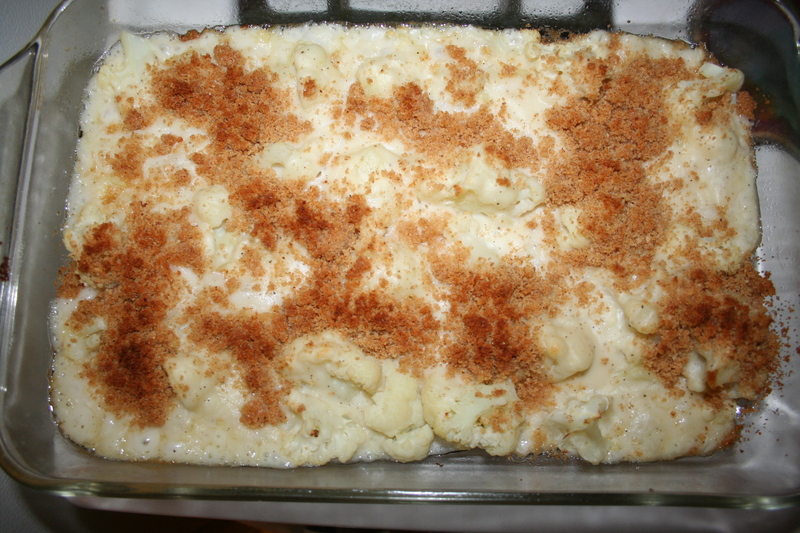 Cauliflower AuGratin got four thumbs up this week. It was a recipe I found on Pinterest. I have had Cauliflower Au Gratin before but I have never made it myself. I’ve never even thought of making it until I happened upon it while perusing Pinterest last week. As I’ve said before, I’m always on the lookout for new things to try, new ways to have “the same old thing.” I thought to myself, “Well, they like mac and cheese,” and figured I’d try this. That’s Mom logic for you. Funny thing is, I was almost right. Overall, everyone except Alex loved it. Alex had peas though, so everyone was happy. Here’s the recipe, straight from “Point-less Meals,” the blog that I pinned on Pinterest. I did have to make some adjustments because of what I did or did not have in my house at the time I made it. I’ve noted them. Place cauliflower in the bottom of a 13 x 9 dish coated with cooking spray. Meanwhile, in a large saucepan, melt butter. Add onions and cook until tender. Stir in flour, mustard, salt and pepper. Gradually add milk, stirring and cooking until thickened. Remove from heat; add Parmesan cheese. Stir until blended. Spread cheese mixture over cauliflower. Mix bread crumbs with butter and paprika. Sprinkle over cheese mixture. Bake, uncovered, at 350 for 30-35 minutes.